I was looking for a replacement battery for a 1982 Honda Superdream. The one I ordered from Tayna was a dry type battery but alas was out of stock. I telephoned the guys at Tayna and they couldn't of been more helpful. They ensured that it's "wet acid type" equivalent was posted the same day despite the cut off time approaching rapidly. It fitted perfectly and for the money is excellent value. Great customer service at a really good price .... Thanks. 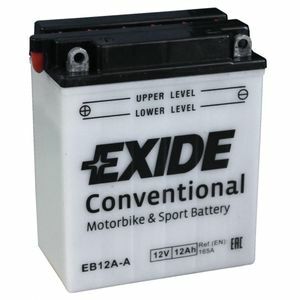 Batterie bien conditionnée, facile à mettre en oeuvre (livrée avec l'acide et des boudons-entonnoirs). Niveau de liquide bien visible. Seule critique : les écrous de fixation des cosses ne se calent pas parfaitement dans leur logement. Delivery was excellent very quick. Was exactly what I ordered. I put it into the bike and it started right up. Perfect dimensions, and correct amp capacity. As always completely correct. battery arrived on time very well packed , acid filling system the best i have ever used. Excellent battery. Fairly priced too. Delivered in a flash! Would recommend and use again! Fantastic company to deal with & after service is second to none. Keeo it up guys i will be returning customer. Quick delivery and well packed. Followed the clear instructions and I was up and running in 30 mins, which included a pint of Tea.